Loves Cloud is a devops and cloud consulting services company. It is based in Noida, India and founded in 2017. We are a team of certified architects and consultants who specialize in making cloud and devops journey smooth, less expensive and more productive for our customers along with their products and services. We work together with you to plan, execute, maintain, automate and optimize all things devops and cloud! How we used DevOps to transform development cycle? Why CEOs Burn Their Hands on Cloud & DevOps? Case 2– CEO calls us for our first meeting and says that his AWS bill should be reduced by at least 80%. He says he is a technologist and knows that their architecture can improve a lot (he was right). His technical team tried to run Docker on AWS but couldn’t do it. They hired a devops resource and couldn’t We audited his AWS account and to be honest, we found out that there isn’t any AWS and devops competency in his team. In both cases, we found one common practice, lack of resources who understood cloud and devops. This was true for almost all C suite executives I interacted with over past year. Cloud and devops is a marriage made in heaven for all things cost optimization, automation, agility and increased collaboration between various teams in-house. Yet, executives frequently find themselves in a situation where projects constantly over-run their cost and effort estimations, they are behind schedule and teams are seriously dis-connected. More Services & Less Servers : This is my favorite, we all love our servers and we can’t get rid of them even when we move to cloud. However, if number of servers increases or stay constant for few months or quarters, you might want to talk to your cloud and devops expert. We found several instances where servers were provisioned left, right and center unnecessarily and running idle, adding to monthly bill. Direct your team to use move workloads away from servers and start embracing managed services provided by cloud platforms. It will save direct cost such as servers running cost, software licensing etc. and indirect costs such as your team’s involvement for maintenance, security, availability of these servers. Automation : All cloud platforms provide IaaS, PaaS and SaaS services that can be automated, from provisioning resources to monitoring to billing alerts et al. Encourage your team to automate tasks, all of them, period. This is a cultural change and like all other changes, it is painful and difficult to adopt. Work with your team to ensure all manual tasks are automated, for eg. all jobs that are created in Jenkins should be automated! Continuous monitoring and continuous security are other good candidates that should be automated along with continuous integration and continuous delivery. Workloads Evolution : Most organizations start with one big application that has a monolithic architecture. 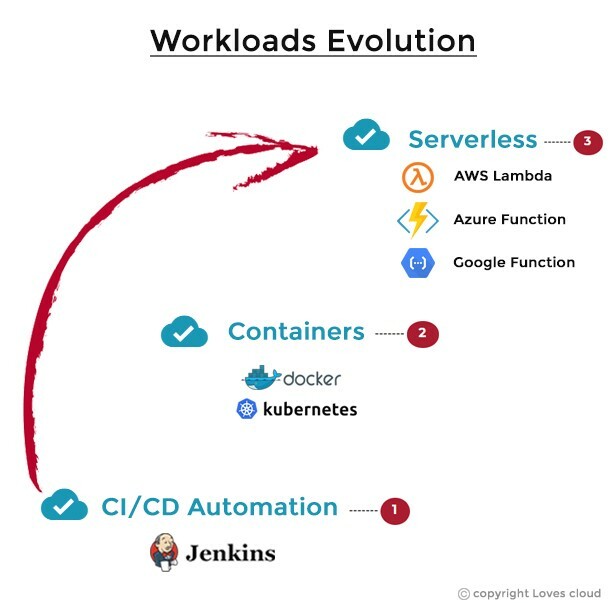 When you move to cloud, ensure that after a period, some part of this application is automated, some of it is containerized and some of it is running using serverless architecture as shown in figure below. If applications continue to run in similar fashion in cloud like they ran off-cloud, there isn’t much benefit that cloud can bring to table. Again, encourage your team to use servers, containers, serverless architectures and managed services of cloud platforms for your workloads instead of just running them on your servers. Agility : Devops embraces principles of agile and if your workloads aren’t agile, something is seriously wrong with them. Use power of devops to provision resources faster, deliver better software and responding to change in requirements. If it still takes days or weeks to provision a server in cloud, then its time your devops and cloud folks need some professional help. Your employees are your biggest strength and it is imperative they know their way in a cloud and devops world. Invest in training and educating them and give them all the support they need to venture into what is a huge paradigm shift. Alongside, keep a close eye on above mentioned guidelines to ensure your cloud and devops initiative isn’t drifting away. Connect with me at albert@loves.cloud if you’d like to know more about devops and cloud. Visit our website www.loves.cloud to know more about our services and solutions for devops, cloud and security. Copyright © 2017 - Company - All rights reserved.